It’s been more than six months since the Cassini probe plummeted to its demise, but scientists are still releasing incredible images from two-decade mission to Saturn. Take this new image that NASA published this week, snapped by Cassini on March 13, 2006. 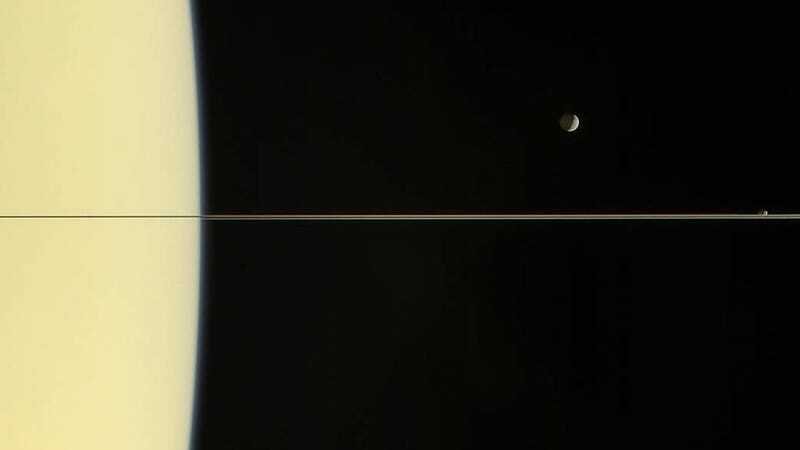 You can see pale Saturn as a looming behemoth, with its rings like a piece of wire slicing the picture in half. The rings really are thin—only about 30 feet (10 meters) from top to bottom on average, compared to the planet’s 72,367 mile (116,464 kilometer) diameter. But they’re in no way uniform. The Cassini probe revealed that each ring contains chunks of ice as tiny as sand grains to several kilometers in size, according to a NASA fact sheet. It also studied the origin of Saturn’s diffuse outer E ring, which seemed to come from the planet’s moon, Enceladus. Here’s the full image, including the moons Mimas (above the ring line), Janus (just touching ring line), and Tethys (below). The NASA press release points out that the moons’ apparent locations here are just a trick of perspective, since the moons orbit the giant planet on just about the same plane. Three of Saturn’s moon are visible: Mimas (above the ring line), Janus (just touching ring line), and Tethys (below).